Caisse to Handle Quebec's Infrastructure? Quebec will turn to the Caisse de Depot et Placement du Quebec to plan, finance and manage new infrastructure projects in Canada’s second-most populous province to ease the financial burden on government. The new projects include transit service from downtown Montreal to the city’s main airport, according to an agreement announced Tuesday by Premier Philippe Couillard and the Caisse, Canada’s second-largest pension-fund manager. The transit link to Trudeau International Airport is one of two projects identified as “priorities” that together require about $5 billion of financing. The other is a public transit system on Montreal’s Champlain Bridge. Both projects must be completed by the end of 2020, the Caisse said in a statement. With gross debt that amounted to $198.1 billion as of March, Quebec is the second-most indebted Canadian province after Ontario. Finance Minister Carlos Leitao forecast a $2.35 billion shortfall for the fiscal year that ends March 31 before balancing the books next year. Caisse Chief Executive Officer Michael Sabia is expanding investments in private assets such as highways and bridges to reduce the volatility associated with public markets. Most of the Caisse’s infrastructure assets — valued at about $8 billion at the end of 2013 — are located outside Canada. In the U.K., the Caisse is a shareholder in Heathrow Express, the rail service that links Paddington Station to Heathrow Airport. 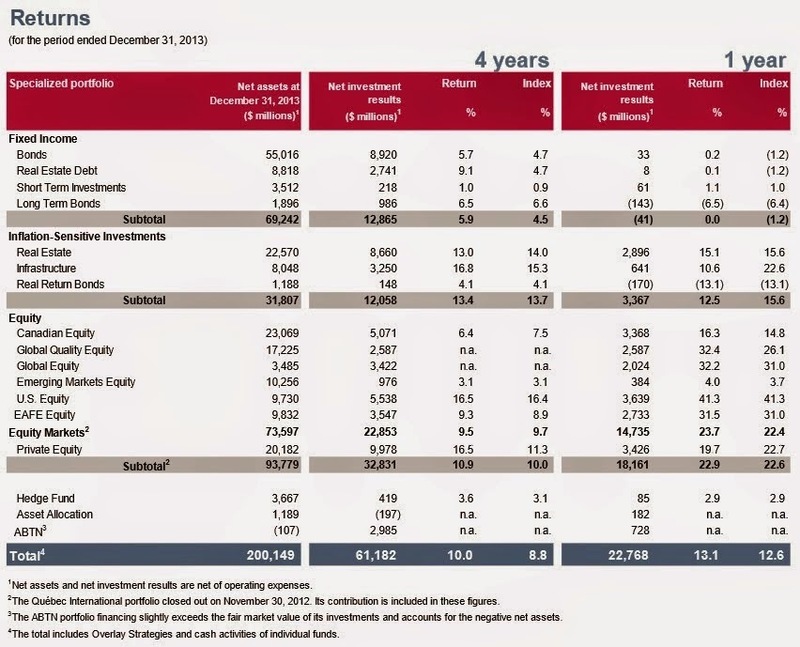 As of June 30, the Caisse had net assets of $214.7 billion. The Caisse will “only assume responsibility for projects that have the potential to generate commercial returns that serve the interests of its clients,” it said in the statement. Quebec must approve legislative changes to create the new infrastructure unit at the Montreal-based pension fund. Canada's second-largest pension fund said on Tuesday it will finance, develop and operate major infrastructure projects for the cash-strapped province of Quebec under a deal the fund hopes will create other such opportunities internationally. The Caisse de depot et placement du Quebec, which manages the province's public pension plans and holds C$215 billion ($180.04 billion) in net assets, said the first two public transit projects identified through the deal will be worth about C$5 billion. The target completion date for the projects, a light rail line on Montreal's new Champlain Bridge and a rail link between downtown Montreal and the city's international airport, is late 2020. The agreement, which must be ratified by the French-speaking province's National Assembly, creates a new Caisse subsidiary, CDPQ Infra. The unit would target projects in Quebec along with markets such as the United States, where some groups say $3.6 trillion must be pumped into crumbling public infrastructure by 2020. "We intend to go further. We intend to export this model," Caisse Chief Executive Michael Sabia told a Montreal news conference. "This model will help (other governments) to meet their needs. And in so doing, this will open new markets." The Caisse and other Canadian investors are also eyeing aging U.S. airports such as New York City's LaGuardia, where a $3.6 billion call for tenders to redevelop the central terminal has attracted bidders including British Columbia-based Vantage Airport Group. Sabia said he and Quebec Premier Philippe Couillard raised the idea of the Caisse pursuing projects in its home province last summer, even as it and other big Canadian pension funds scour the world for long-life, revenue-generating infrastructure assets. According to data from London-based research firm Preqin, three of the 10 largest infrastructure investors worldwide are from Canada. The Caisse holds almost $10 billion in global infrastructure assets, and is a shareholder in the UK's Heathrow Express, the rail service linking Paddington Station and Heathrow Airport. Sabia insisted that transit projects developed by the Caisse would generate return "in line with market standards," and that CDPQ Infra will not be controlled by the Quebec government. "There is no question here about compromising independence," he said. "There is no question of the government imposing things, there is no question of the Caisse becoming the financial arm of the government." There is no question about compromising independence but they better make sure the bidding process and tender offers for these projects are rigorously scrutinized to avoid any shadiness whatsoever and another Charbonneau Commission down the road. The commercial partnership announced Tuesday by the Caisse de dépôt et placement and the Quebec government can be viewed in several ways. In one respect, it’s a big win for the Montreal region, which will get $5 billion in financing for two badly needed public transit projects: a light rail line for the new Champlain Bridge and a new rail service linking the downtown area to the West Island and Trudeau airport. On another level, it’s an admission that you can no longer leave the construction of a big public project in Quebec in the hands of the private sector. We’ve seen too many scandals and too much fallout from the Charbonneau Commission for business to proceed as usual. Michael Sabia, chief executive officer of the Caisse, is now the guy wearing the hard hat. He’s pledging not only that the giant public pension investment fund will finance, build and operate the two projects but also that the process will be conducted with rigor and transparency. The Tony Accursos of the world need not apply. 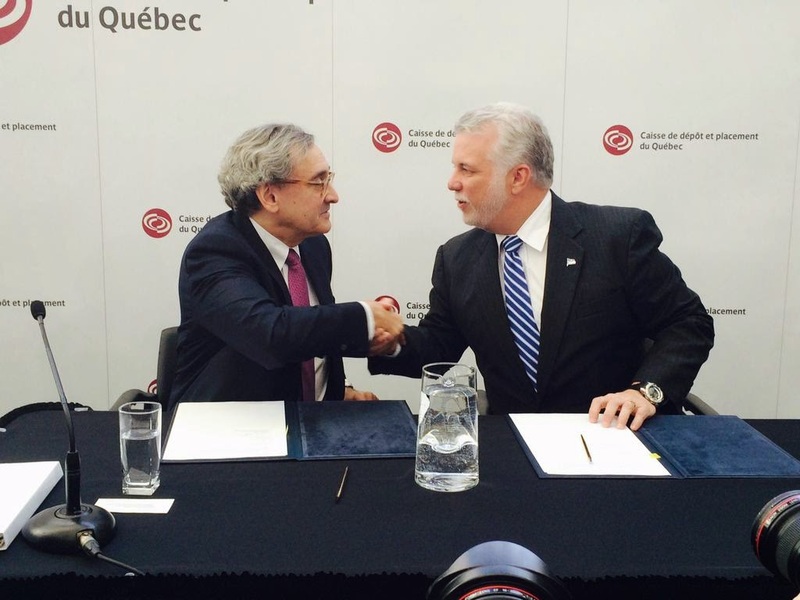 There are other reasons to like the deal struck between Sabia and Quebec Premier Philippe Couillard. The Caisse is a $10-billion player in infrastructure around the globe — from Heathrow Airport in London to the port of Brisbane in Australia to transit lines in Bordeaux, Fra., Melbourne and Boston. Strange that it’s never really been a significant investor in such deals at home. And no, you won’t get ripped off, he pledges. The chances of Quebecers paying excessive ticket prices are small, according to Sabia, because the Caisse will have a financial interest in making sure that as many users as possible take the trains. But here’s the rub. For all the talk by Sabia, Couillard and Montreal Mayor Denis Coderre about a win-win-win, Tuesday’s announcement had the hallmarks of a bailout of the Quebec government. The Caisse, with $214 billion in assets under management, has the deepest pockets in the province, while its political masters in Quebec City are essentially broke. The commercial entente opens the door for the pension fund to do more such financing in the future. This is a neat way for the government to sidestep its financial responsibilities and offload the risk onto the Caisse. The government has a $90-billion shopping list of infrastructure projects during the next 10 years, but little money to pay for them while it’s carrying a direct debt of more than $200 billion. This raises a bunch of issues. Yes, investing in infrastructure makes sense for pension funds because it provides long-term returns to meet long-term obligations. But if projects turn out to be money-losers, then Quebec’s pensioners are on the hook. Diversification is important, too. Down the road, the Caisse will want to look at many of the projects that will be proposed by Quebec City, but there must be limits set on how much of its risk is concentrated in this province. Then there’s the political angle. The Caisse may be a provincial agency, but its independence is important, especially to financial markets. Any suggestion that it’s under the thumb of the government will affect the kind of deals it can make and the returns it earns. For now, the partnership between the Caisse and the government looks good. The Montreal economy badly needs the two transit projects to relieve congestion and provide essential transportation links to the airport. Let’s just hope the agreement doesn’t become too much of a good thing as the government leans more and more on its rich cousin for support. While the Board of Trade of Metropolitan Montreal and Quebec Manufacturers and Exporters were quick to praise the deal, opposition politicans had reservations. Nicolas Marceau, finance minister in the last Parti Québécois government, said Quebec was shifting the burden of investment risk and potential cost overruns onto Quebecers’ retirement fund, putting its independance at risk. Opposition leader Stéphane Bédard claimed the Liberals were making the Caisse and its investors pay for their election promises. Michel Nadeau, executive director of the Institute for Governance of Private and Public Organizations and a one-time Caisse executive, said the deal is a surprise but not an unpleasant one. Infrastructure returns have generally been good to the Caisse and most of the other large Canadian public pension funds. But returns on infrastructure have been declining over the years as more and more large funds scour the globe for deals. Worse still, pensions are inflating an infrastructure bubble, and many of them are taking on too much illiquidity risk at the worst possible time. Now, this deal is different and could potentially be used as an example for many other governments to use public pensions to fund their domestic infrastructure needs. As Michael Sabia notes, there are huge infrastructure needs around the world, especially in the United States where 60 Minutes recently reported that neglected infrastructure is falling apart. But the key here is governance. Canadian pension funds operate at arms-length from the government and are supervised by independent and qualified board of directors. The Caisse, CPPIB, Ontario Teachers', OMERS, and others have teams in place to invest directly in infrastructure, avoiding huge fees funds would charge them. In the U.S., most large state pension funds are simply not equipped to do these direct deals and their governance is fraught with conflicts of interest and political interference. Below, the CBC's Amanda Lang interviews Michael Sabia, the Caisse's CEO, on Quebec's Caisse deal to build light rail transit for Montreal's airport in Dorval and Champlain Bridge as soon as 2020. I also embedded the entire episode where you can watch Amanda Lang interview me on the proposed legislation to regulate Canadian pensions (fast forward to minute 28 and wait for commercials to end). I actually ran into Michael Sabia at the lobby of CBC's building in Montreal as we arrived at the same time. It was the first time we met even though I have repeatedly asked him for interviews. He was very pleasant after moaning about the freezing cold weather. I told him I was there to discuss whether pensions are systemically important and should be regulated and we chatted a bit on markets. I told him that I had a discussion that morning with Jim Keohane, CEO of HOOPP, who told me the drastic plunge in oil prices is being exacerbated by demand factors and suggests global weakness. Michael agreed stating while the decline in oil acts as a tax cut it signals a weak global economy. Michael added "2015 will be a very tough year." He was particularly bearish on Europe where he said the ECB will likely crank up QE, leading to a temporary boost in equities, but unless they do something on the fiscal front to deal with structural issues, he sees a prolonged period of European stagnation. When I told him that Blackstone and other private equity giants are investing heavily in Europe, he looked at me with this look which said "I wish them luck." We were then escorted to different locations to tape the show. That was a weird experience for me, staring deep in a camera lens while sitting in a dark room with spot lights flashing in my face. A nice camera man was asking me all sorts of questions on pensions and investments while I was trying to listen to Michael Sabia's interview which was taped right before mine. I gave him good advice after we taped my interview. My only regret was not using my five minutes of national fame to state my position on enhancing the CPP for all Canadians and addressing the myths, misinformation and lies the financial industry is spreading on defined contribution plans. Oh well, maybe next time! Will the Fed Make a Monumental Mistake? Soros Warns Pensions on Hedge Funds? A Political Earthquake in Greece? ECB: A Day Late and a Euro Short? Bank of Canada's Turn to Shock Markets? Taming New Jersey's 'Insatiable Beast'? Is OMERS Worried About Deflation? Another Big Blow to Hedge Funds? On the Verge of Another Euro Crisis? An Insider’s View of Canada's Pension Debate? Best and Worst Hedge Funds of 2014? The Coming War on Pensions? Outlook 2015: A Rough and Tumble Year? Engineering Your Alpha This New Year?